Tigers, elephants, lions and other large mammals have so far been central to India's conservation story. In spite of the country's vast coastline and millions being dependent on marine resources for their livelihoods, such species and habitats have been largely neglected in writings on wildlife. 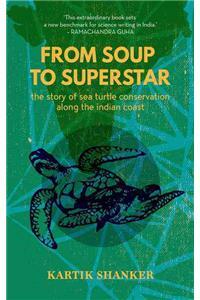 From Soup to Superstar provides the first comprehensive account of marine conservation in India, focusing on sea turtles, which are at once a fishery resource, a religious symbol and a conservation icon. Worshipped as Kurma, the incarnation of Vishnu, by several communities, these creatures have been part of folklore and mythology for over 2,000 years. Until the 1970s, there were large- and small-scale turtle fisheries in Odisha and the Gulf of Mannar, while eggs and meat were consumed along the rest of the coast. Since then, several conservation programmes have been led in these regions by naturalists, scientists, activists and concerned citizens with diverse, often conflicting, approaches. Globally, attention has centred on the mass-nesting beaches in Odisha, where over 1,00,000 turtles may nest simultaneously. New threats have emerged and elicited responses at local, national and international levels. Bringing together a range of issues and actors that have affected the world of sea turtles, filled with fascinating insights into scientific research and human-animal ecologies, this is a definitive chronicle of the efforts that have been made to protect these mysterious creatures in the last fifty years. Kartik Shanker was inspired to a career in ecology by an ancient reptile, a sea turtle that crawled ashore late one night in Madras (now Chennai). As faculty at the Centre for Ecological Sciences, Indian Institute of Science, Bengaluru, he now indulges in his fascination for ecology and evolution, working with students on frogs, reptiles, birds, plants, reef fish and other marine fauna. But that initial encounter with the turtle, an olive ridley, hooked him for life. In the twenty-five or so years since then, he has helped establish a students' group for sea turtle conservation in Chennai, conducted research on olive ridleys in Odisha and leatherback turtles in the Andaman and Nicobar Islands, started newsletters and websites, conducted international symposiums on sea turtles, and established regional and national networks for coastal and marine conservation. He has also served as the president of the International Sea Turtle Society and regional vice-chair of the IUCN/SSC Marine Turtle Specialist Group. Shanker is a founding trustee of Dakshin Foundation, which works largely with coastal communities on natural resource conservation and management, and a founding editor of the magazine, Current Conservation. In his spare time, he seeks to distract young minds from more serious pursuits with books such as Turtle Story and The Adventures of Philautus Frog. Kartik loves hanging out in the islands, diving at reefs and looking for turtles, a passion that he shares with his family. At home, in Bengaluru, sadly, he is a slave to Meera, Vishak and two cats, which leaves little time for important activities like playing the guitar, basketball and going to the gym.